LOW Those damned homing speed-salamanders. WTF How can you have a goth witch? She’s already a witch! Citrouille is every bit as simple as the old-school games that inspired it. Why was Lode Runner collecting things? Why did Mr. Do? Was there any real reason for Jumpman to seek out those clusters of pixels? Citrouille offers just a touch of context – some bad witches don’t like candy! So some good witches chase them down and… plant flowers? Sure, why not. It’s Halloween! A 2D puzzle game that feels as much like Burger Time as anything else, Citrouille has one or two players running around a variety of maps, causing blossoms to pop up whenever they step on the flowerpots embedded in the ground. Walk across all the flower pots and all the bad guys explode, leaving them free to proceed to the next level, because… witches? There are complications, of course. namely, a variety of enemies with different attack ranges and methods for chasing the player down. Small enemies can be destroyed with a physical attack, while larger ones can only be disposed of via single-use weapons that the player must find in boxes floating around the levels. 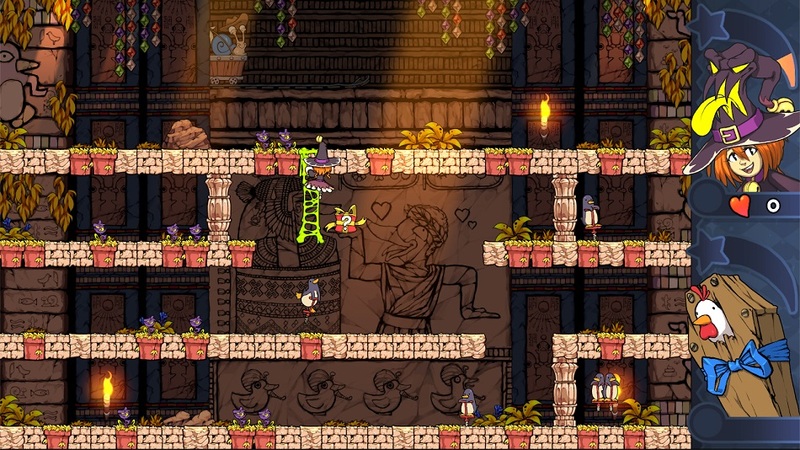 There are rarely enough weapons to kill all of the monsters, though, so it’s up the player to master the tactics of evasion — it mostly centers around the witches’ portable ladder, which can instantly create a new path up or down a single level. The witches’ foes have similarly ingenious tricks up their sleeves. Some can leap from floor to floor without climbing, others can eat the flowers that the player so painstakingly sowed, forcing them to double back – one particularly annoying beast can charge directly at the player at high speed, always taking the most direct path. Those particular creatures, while just as cute as all of the characters, are so incredibly effective at killing that they almost feel like the kind of thing dropped into a game by an unscrupulous developer intent on making sure players keep pumping in quarters. Citrouille has just a few zones with a handful of levels in each, and just a single boss fight. The levels are well-designed, and there are new threats introduced in each new area. However, it’s an extremely short game, and after a player has beaten it, there’s nothing to demand a second visit. The only sop towards longevity is a battle mode for up to four players that switches things up so that players are competing with one another instead of cooperating. It’s a decent twist on the formula, but with just four possible characters and a small number of maps, it feels a bit threadbare. Disclosures: This game is developed by Lumen Section and published by Plug-In Digital. It is currently available on PC. This copy of the game was obtained via publisher and reviewed on the PC. Approximately 2 hours of play were devoted to the single-player mode, and the game was completed. 1 hour of play was spent in multiplayer modes. Parents: This game was not reviewed by the ESRB, but contains Fantasy Violence. I’d put this around an E, really. Everything’s cute, when monsters die they disappear in puffs of smoke, and the scariest thing that ever happens in the game is a mass of chickens flying around the screen. 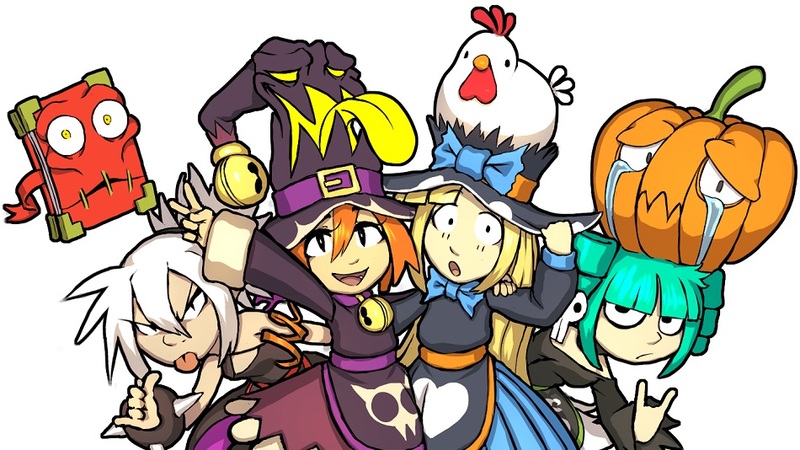 It’s a game about witches loving candy, and it’s safe for all. Deaf & Hard of Hearing Gamers: I played nearly the entire game on mute and had no difficulties. This is an arcade-style game, so the only text appears in menus. The text is not resizable. This game is fully accessible. 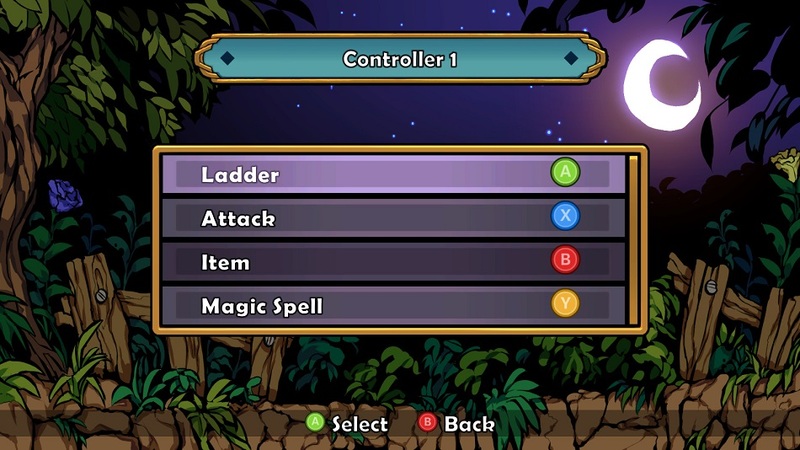 Remappable Controls: Yes, this game’s controls are remappable.